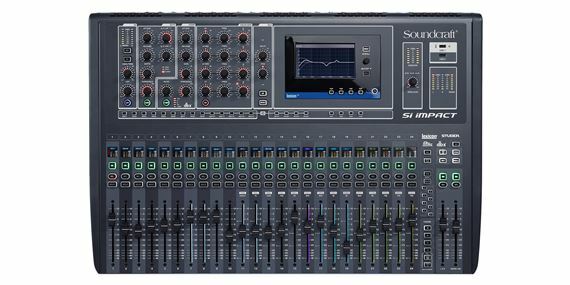 Exclusive 12, 8, 5 or 3 Easy Payments on Soundcraft Si Impact 32 Channel Digital Mixer only at AMS! Free 2 Day Shipping & Free Extended Warranty. Call our Gear Experts at 800-319-9043 for expert advice! The legendary British sound. From humble beginnings in London more than 40 years ago and still designed and engineered in the UK, Soundcraft defined the term 'British sound' in live sound mixing consoles. 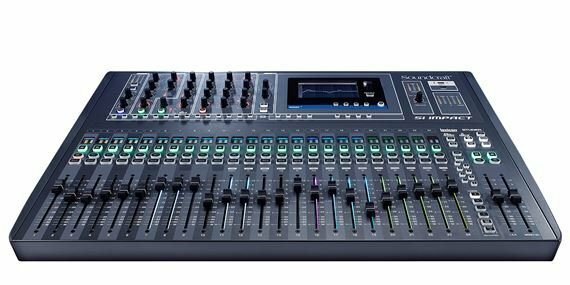 Combining One-Knob-One-Function control with unique features like FaderGlow, Soundcraft combines analogue workflow with digital flexibility. FaderGlow illuminates the fader track in different colors to provide at-a-glance status information on precisely what the fader is controlling – aux sends, FX sends or even the graphic EQ that's available on every bus. Each fader channel also features a clear multi-color LCD display - giving 'at a glance' information on levels and offering a fully customizable scribble strip to name your channels. Si Impact makes recording quick and easy with superb quality, built-in 32-in/32-out USB recording and playback – and a free download of Ableton Live Lite 9 is included. A single connection to your PC or MAC and you're ready to make multi-track recordings direct to any digital audio workstation. 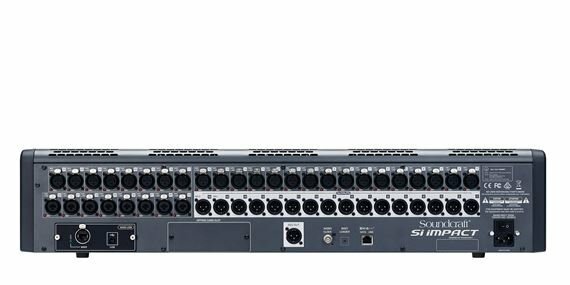 Send up to 32 inputs and 32 outputs to and from your DAW for recording and playback. 5 stars on blemished order I just unboxed it. It's clean but minor scratch just like the salesman told me it would be. I'm just looking into the registration and instructions so I haven't poowered it up yet. I hope it sounds as good as it looks I got this for half price and was expecting something to be bent or dropped no evidence of that happening Bonus for me!! I will give part two of my review after I power it up and test it. My Si Impact came in within two days of shipping. American Musical Supply, you guys are the best. I call them for support on this mixer and they helped out. This mixer is great. Sounds warm. Analog Digital sound. 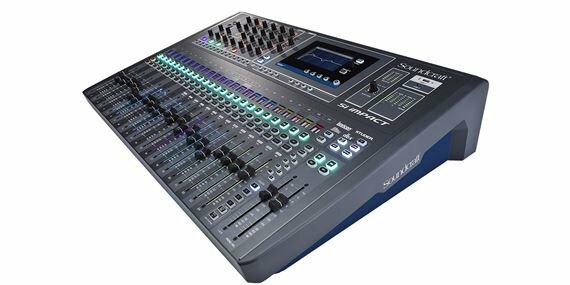 After 18 years of working with and being influenced by a sound crew of predominately analog purists I took the plunge and purchased the Soundcraft SI Impact. This is an incredible mixing console with the 100 plus pounds of outboard gear (EQs, compressors, effects, etc) I used to haul to every gig built into the Impact. The intuitive layout of the Impact made it extremely easy to to navigate and setup channels, outputs, EQs, effects, groups, VCAs, etc right out of the box. The online manuals and video tutorials on the Soundcraft site will get the most novice user up to speed in a short amount of time. Every musician and band I have worked with since purchasing the Impact have noticed and commented on the improvement in the FOH sound and clarity of the monitor mixes. This board is extremely easy to use. I highly recommend it to anyone wanting to dive into the digital pool for the first time of upgrade to what I consider one of the best digital consoles on the market. Wonderful and intuitive. A must have. Having used this a few times already for an outdoor worship service and indoors, I can't brag enough how easy it is to use. Setting up groups and color coding your channels is super easy! All the effects and none of the headaches!!!! Just awesome sound quality. Great board for the cost, typical "British" sounding board, very functional and easy to use. Tracked to Logic & Pro Tools as an experiment worked great and set up was easy. Function is good but the most important thing is it sounds good and is easy to get your mix. Awesome, great board, amazing,compact and powerfull. AMS great service i order and less than a week i have it in my hands. was impress by its easy features.